In the entire history of the X-Men franchise, the number of mutant characters that have been created is nearly endless. The world is full of mutants, and just because they’re not attending Xavier’s School for Gifted Youngsters, doesn’t mean that they’re not out there, someplace. It seems that every time we turn around we’re learning of a new mutant that we’re going to run into in X-Men: Apocalypse. Now we have yet another that we’ll apparently meet in a record store, sort of. Sophie Turner posted this image on her Twitter feed of a shot from the upcoming X-Men: Apocalypse of her character Jean Grey in a record store (ask your parents kids), browsing through albums when Scott Summers comes across an album for what Sophie claims is their favorite artist, Sounds of Light and Fury by Dazzler. 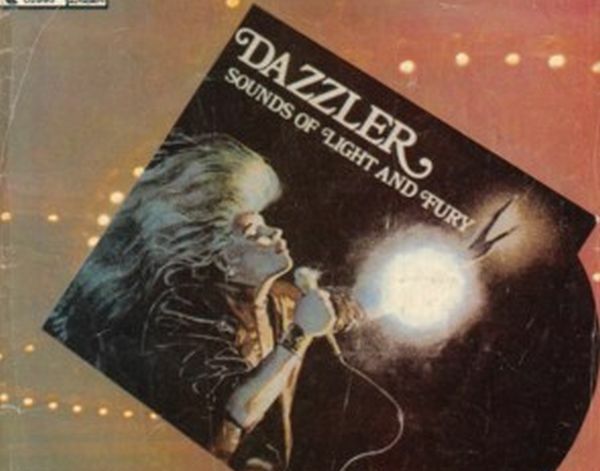 As X-Men fans will know, Dazzler is a mutant capable of turning sound waves into light and energy, something she appears to be doing on the album cover itself. Dazzler was created in 1980 and was actually done as a promotional deal with a record company. Originally Dazzler was conceived to be a disco singer, but as tastes have changed over the years, the character has moved through several different genres of music. This album cover screams 1980’s about as much as any band from the actual 1980’s did. Thus far we have never seen Dazzler on the movie screen as an active character in the X-Men universe. She’s been portrayed on the animated series, and was also one of the character choices in the classic X-Men arcade game, but this is now as close as we’ve come to seeing Dazzler on screen. Which is a shame as the character could be a lot of fun to use in a movie. If you’re even more familiar with classic X-Men comics, you might even recognize the album cover, as it’s taken directly from a Dazzler comic that was released in 1983. Of course, we have to wonder what the two X-Men are saying about Dazzler in this moment. Are they laughing about the hair? Are the two young, eventual, love birds going to bond over their shared love of 80's pop music? Was Dazzler the Taylor Swift of the mid 80’s X-Men Universe, or did they find this one in the bargain bin? And is this Dazzler played by pop star Taylor Swift, as Collider suggests? While X-Men: Apocalypse will be out in less than a month, we’re learning about a lot of new mutants who we didn’t previously know about. Text hereThe Blob and Wolverine will also be making appearances in the new movie. While Dazzler appears relegated to an album cover, we suppose it’s better than nothing.